Discuss application theming and theme development. Thank you Santa; it's nice to have AK back. The above pic is what I'd like to use in the AK2 Downloads window, but it's actually a very controlled business this theme stuff, you know. If something doesn't fit with the mood of one of my themes, then it doesn't go in. Pity. 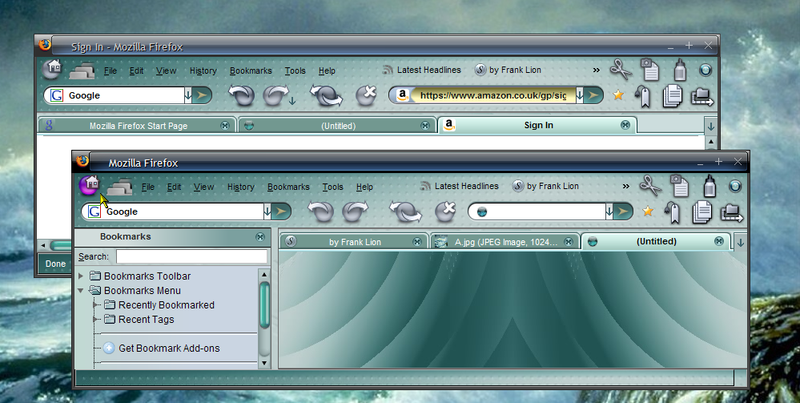 The conversion of Aluminium Kai 2 for Firefox 3 was completed in two stages. The first stage was version 3.1.6, which dealt primarily with the migration of this theme to use my normal Metal Lion code engine and ensuring good functionality and 'bug hunting'. This next version, Version 3.3.3 has dealt much more with the actual appearance side and creating a softer, more unified look. Apart from any possible bug fixes, this now is the finished look for Aluminium Kai 2 for Firefox 3. 1. Fullcreen windows control icons bug fixed. 2. New restyling of Downloads Window, Addons Manager, Edit Bookmarks Window. 3. Minor restyle changes to Options Window. 4. Restyle of menu borders, all tabs button, tab scroll buttons. 5. Restyle of searchbar history/suggestions list. 6. Restyle of Smart Location Bar dropdown list. 8. Top of Sidebar restyled. If it looks as though I've just copied and pasted that lot straight from my website, er, it's probably because I have, well, I am on holiday, you know. This version mops up the changes that I didn't have time for before Christmas. AK2 needed a softer look, I thought, and this was made more urgent by the changes in Firefox 3 itself. I'll spare you the 'technical details and reasons' but, suffice to say, AK2 now looks better and looks as I want it to when using Firefox 3. As usual, all support question, feature requests, etc to the 'Contact Us' link here, please. btw might do some more pics of the changes...if I remember. Very sweet, Frank. This has always been my favorite theme of yours (excluding BMV, of course). The color palette that you used is fantastic, and the expert coding of your themes assures I never have issues while using them. 1. Restyle of tabbar Alltabs button. 2. History View button colour change. 3. Repositioning of Edit Bookmark Window. 4. Added @import url for Metal Lion 300 loading screen option instead of blank screen. 6. Googlebar Lite extension background fix. Brilliant work, Frank. You always seem to stay ahead of the curve; always refining your themes so they look great, and work flawlessly. http://www.myspace.com/mudfooot | Error 4Q - This signature no longer exists or can not be found. No problem, Jim. I try to keep the standards up. Good to see Mud still 'going the extra mile' on his posts. Sheesh, no need for sarcasm here Frank, words can hurt too you know.. I'm sorry, living in modern -metric- continental Europe I thought going an extra 0.621371 mi would suffice. Dammit, it was late, 4:22 in the gawd-dawned morning! I was still recovering from a questionable kebab and under the influence of self-prescribed, alcohol containing medications. You know I'm a man of little words -mostly one syllable, four letter words- and you know I love every theme you ever made and I haven't been looking at anything else but AK2 ever since it was released. ^^ Put that in quotes, you....plagiarist. Rats! Just updated to 3.5 and whaddayaknow.., AK was brutally disabled.., deemed incompatible with this, all new Fox incarnation. Bumped it with Mr.Tech's invaluable tool kit and got it working but, some nastiness is showing. The vertical scrollbars are callously clipped and something most disturbing has happened to the text in the (active) tab. yep, bumping themes is never successful...as you just found out. Teach you to not update Firefox until I'm ready, won't it? Short version - AK2 has been done for a while (*cough* see my post above.) and is now undergoing the usual testing, retesting and more testing and will be released soon. BTW - you ever notice, even when I was on Addons, how short my support threads here were? That's because my stuff goes out when I say it's ready and not before...saves fixing stuff later on and keep my users happy. Me not silly. 2. Urlbar recoding for various security states. 3. Net Error pages fix. 5. New Privacy Mode pages fix. 6. New tab button on tabbar fix. 8. Changes to text colours in Addons Manager for Linux users. 9. Throbber on toolbars, sidebar, etc fix. 10. Video/audio media controls fix. 11. Clear Recent History window fix. 12. Session Restore window fix. 15. New images created for Privacy mode and other new features. Well, Madames et Monsieurs, that's all the 3.5 updates done. So, until we meet again, I'd just like to leave you with a little song and remember...be careful out there.